UNIQLO - "UT Vote and Win" - Hello! Welcome to my blog! I recently attended an event of Uniqlo in Mall of Asia last Saturday. Just for the benefit of everyone. UNIQLO is a global apparel brand set to conquer the Philippines with their first store in the Philippines, which will be located at the SM Mall of Asia in Pasay City, this coming June 15, 2012. UNIQLO is a brand known for its philosophy of not following trends and yet allow people to express themselves through unique clothing line. 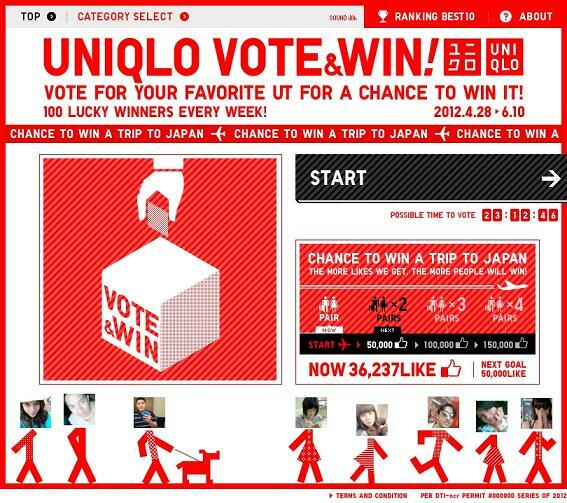 In preparation to the grand opening, they had just launched their online promo called “UT VOTE & WIN” (http://www.uniqlo.com/voteandwin), an online and on-site promotion for UT, UNIQLO’s T-shirt brand. The UT campaign seeks to provide Filipinos an early experience about UT and UNIQLO before its opening. As shared by Mr. Katsumi Kubota, Managing Director of Fast Retailing Philippines. That opening their store here in the Manila, Philippines, is their another step to make the brand globalize. He also shared some ways to enjoy the UT Uniqlo shirts. One is that they have very good quality. to be able to wear good quality is to be able to enjoy it. Another is variety. Uniqlo has been offering great variety, colors and style since it started. Now with these two, you can't go wrong and you'd definitely wear it your way and express yourself better. “UT VOTE & WIN” promo participants have the chance to win free UT products or a free trip for 2 to Tokyo, Japan, which includes round-trip tickets for 2 and hotel accommodation. There are two easy ways to join: via the UNIQLO Philippines Facebook page or by visiting the UNIQLO Hoarding Wall at the SM Mall of Asia. The featured UT designs that participants can vote on are Barbie, Hello Kitty, Concord Graphic, Metal Gear, Lords of Liverpool, Andy Warhol, Orla Keily, Laura Ashley, Gundam, and Corporate Collaborations among others. All these designs will be available at the UNIQLO Philippines store. Check out photos of some designs I took. More photos on my next post. There will be 100 winners of UT merchandise weekly. The winner of the Japan trip, on the other hand, will be chosen among participants who voted the winning UT design, via electronic raffle and will be awarded on the opening date of the UNIQLO Philippines store on June 15, 2012. Plus, if UNIQLO hits 150,000 facebook likes, more UNIQLO fans will have the chance to win a trip for 2 to Japan. Online winners of UT products will be sent a confirmation email before they can claim their prize at the UNIQLO Redemption Booth at the UNIQLO Hoarding Wall, while those who voted in SM MOA can claim their UT product immediately also at the UNIQLO redemption booth. Promo starts April 28, 2012 and ends on June 10, 2012. So vote vote vote make sure to “LIKE” the UNIQLO Philippines Facebook Fan Page (www.Facebook.com/uniqlo.ph) and visit the page regularly for more exciting announcements.